European equities and futures on the , Dow and NASDAQ 100 crawled back into the green this morning after giving up some of the gains that had been triggered by two of the world’s most prominent central banks confirming a bearish stance on Wednesday. The was initially pulled down by miners, while automobile producers offset a deeper decline. Earlier, in the Asian session, China’s tumbled -1.6% lower, while Japan’s rebounded (+0.11%). In yesterday’s U.S. session, equities pared Tuesday’s losses after FOMC records of the last policy meeting were published. The S&P 500 climbed 0.35%, rebounding from its first decline in nine days, as fresh U.S. CPI and core CPI readings showed inflation remained tame in March, strengthening the case for a more accommodative monetary policy. The eked out a 0.3% gain, pressured by a continued slide in Boeing (NYSE:) (NYSE:BA) shares on the re-ignited U.S.-E.U. dispute over aircraft subsidies. The sealed a 0.69% advance, as technology firms led gains, posting their highest peak within the short-term uptrend since the December bottom, and closing near the height of the session. The was the clear winner of the session as it surged 1.38%, nearly erasing two days of losses. Technically, after the price was unable to remain above the 200 DMA on Tuesday, it returned above it. On April 3, the small-cap benchmark broke the topside of a falling channel since Feb. 25. 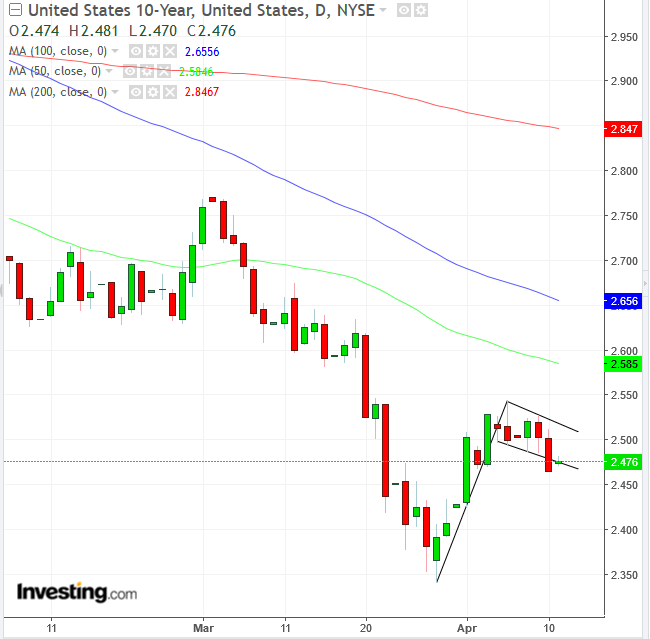 Yields on 10-year Treasurys pared yesterday’s steep second-day slide, and are currently struggling against the bottom of a falling flag—bullish following their rally since March 28. The dollar dropped for the fourth straight day, after nearing the top of a rising channel since the beginning of the year. The greenback’s weakness fueled gains for emerging-market stocks, which advanced for a tenth consecutive session, extending their longest run since January 2018. Overall, Treasury yields and the USD were mostly weighed down by the Fed’s wording, which seemed to not fully exclude a rate move in either direction later this year—including downward—should economic data warrant it. Interestingly, the euro held steadier against the dollar, possibly due to the fact that Draghi was more adamant than FOMC members in explicitly ruling out interest rate hikes for 2019. Meanwhile, former Fed Chair Janet Yellen criticized U.S. President Donald Trump’s controversial Fed picks, which she thought were based on political affiliation rather than economic professionalism, adding fuel to the fire. In the U.K., the pound initially ticked higher, to then reverse lower after E.U. leaders agreed to postpone the country’s departure from the 28-nation bloc to Oct. 31—unless it fails to participate to the upcoming EU election, which would trigger a forced separation on June 1. 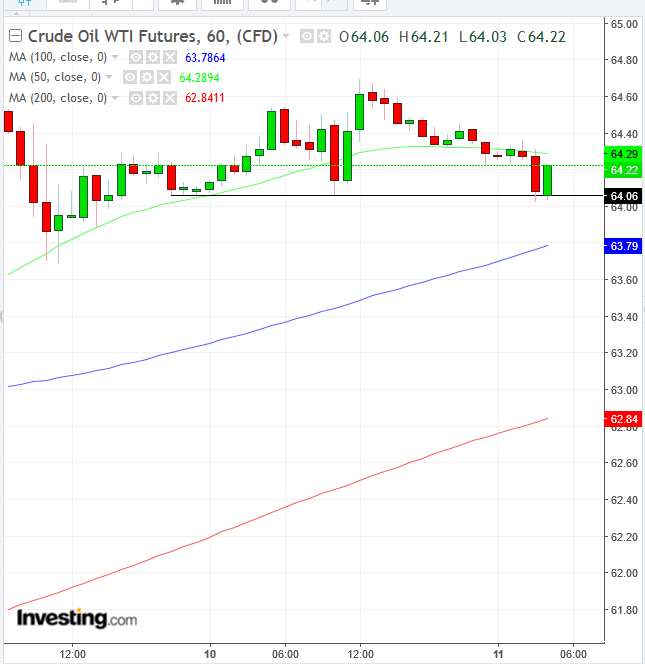 Oil slipped off its rally amid Russia’s plans to step up production and increased outlook for tighter global supply The price jumped 4 AM EDT, reaching the support since 21:00 EDT yesterday. The Bloomberg Commodity Index slid 0.2%, the biggest decrease in two weeks. fell 0.5% to $71.40 a barrel. LME dropped 0.3% to $6,445.50 per metric ton. Gold declined 0.1% to $1,306.32 an ounce, the largest drop in more than a week.